If you follow me on social media (Facebook, Twitter, or Instagram) you may have seen some pictures of what I am talking about. On Sunday we went to the Canton Farmers Market. I picked up a great assortment of goodies. From Pure Pastures we got some chicken ($7) and some pork sausage($7). 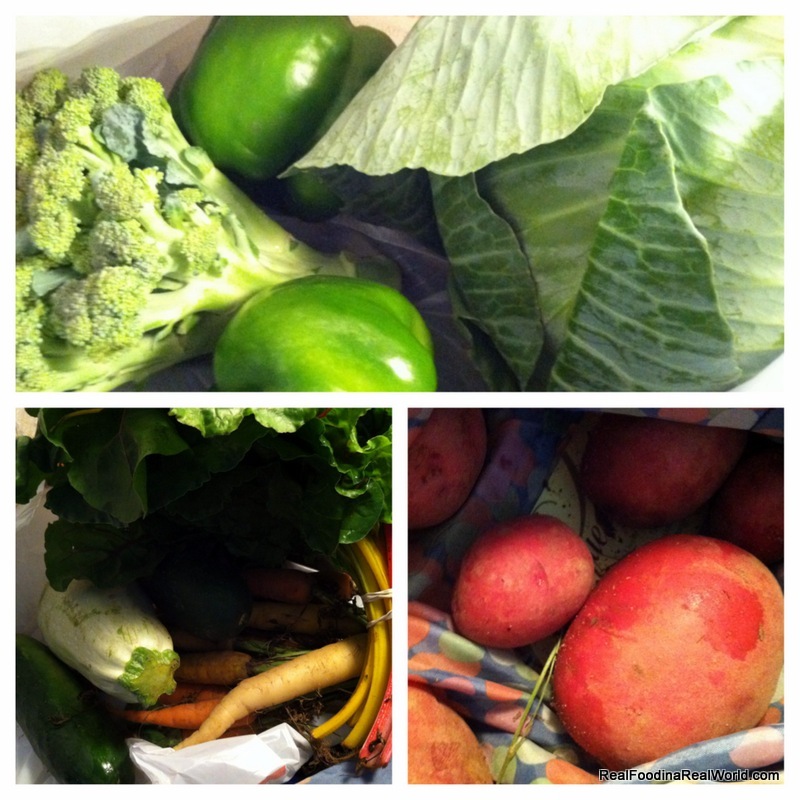 From Prochaska Farm we got cucumbers, cabbage, bell peppers, broccoli and squash(I think like $6 total). From Hand Sown Farm we picked up beautiful multicolor carrots, potatoes and some chard ($8ish?). Monday I picked a green bell pepper and a tomato out of my “garden.” I also picked a purple bell pepper and some banana peppers late Thursday night. Tuesday I hit the veggie lotto! My son attends a playgroup that was hosting a Summer Camp this week. On Tuesday we got to harvest from their beautiful huge garden! 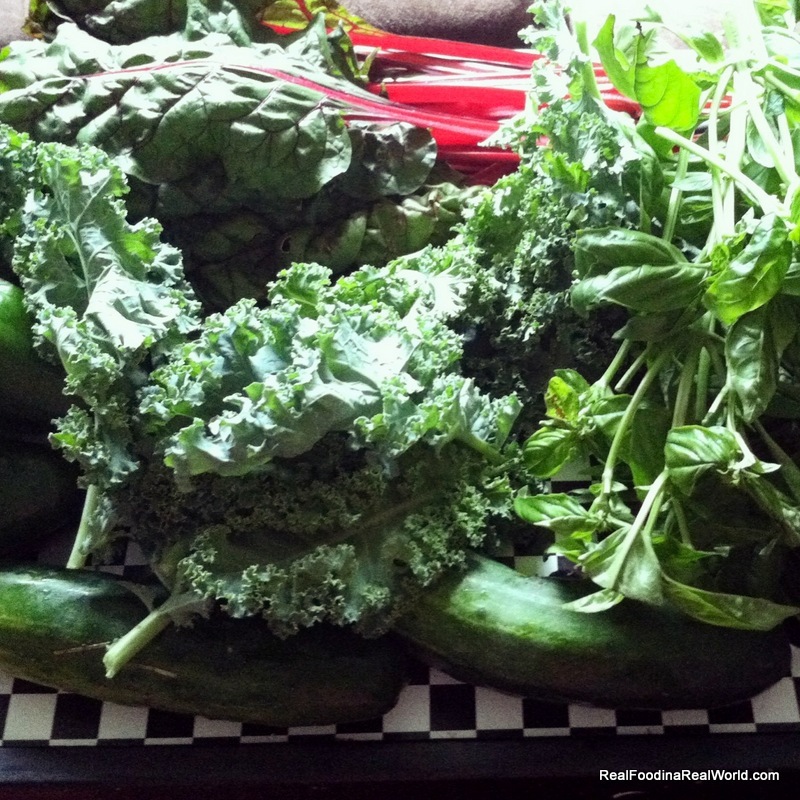 We picked chard, kale, cucumbers, bell peppers and tons of basil (did I mention FREE?). 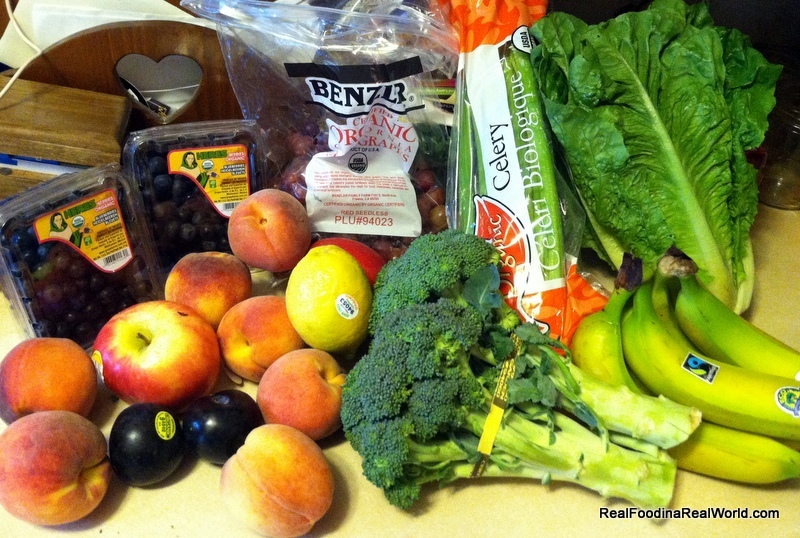 Wednesday is my Door to Door Organics day. Lots of goodies this week. 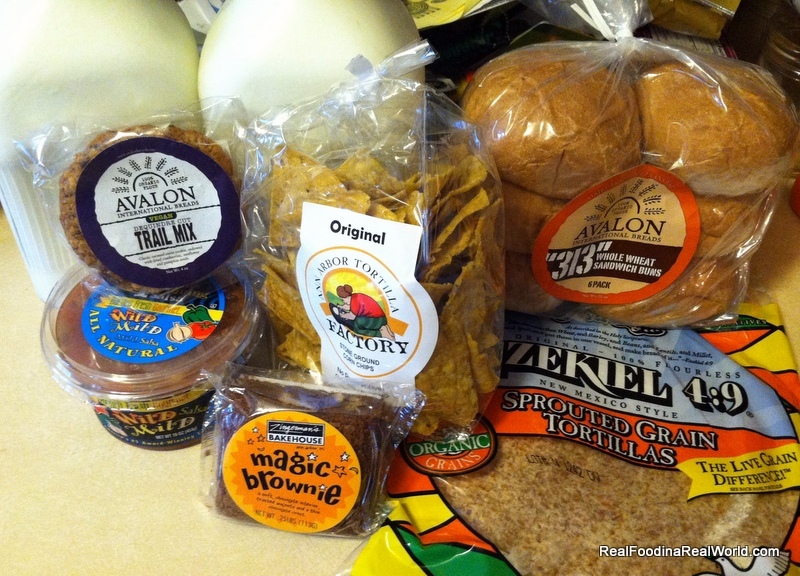 Calder Dairy milk, brownie from Zingermans, hamburger buns and Trail mix cookies from Avalon, Ezekiel tortillas, Ann Arbor Tortilla Factory chips, and Garden Fresh Wild Mild salsa. 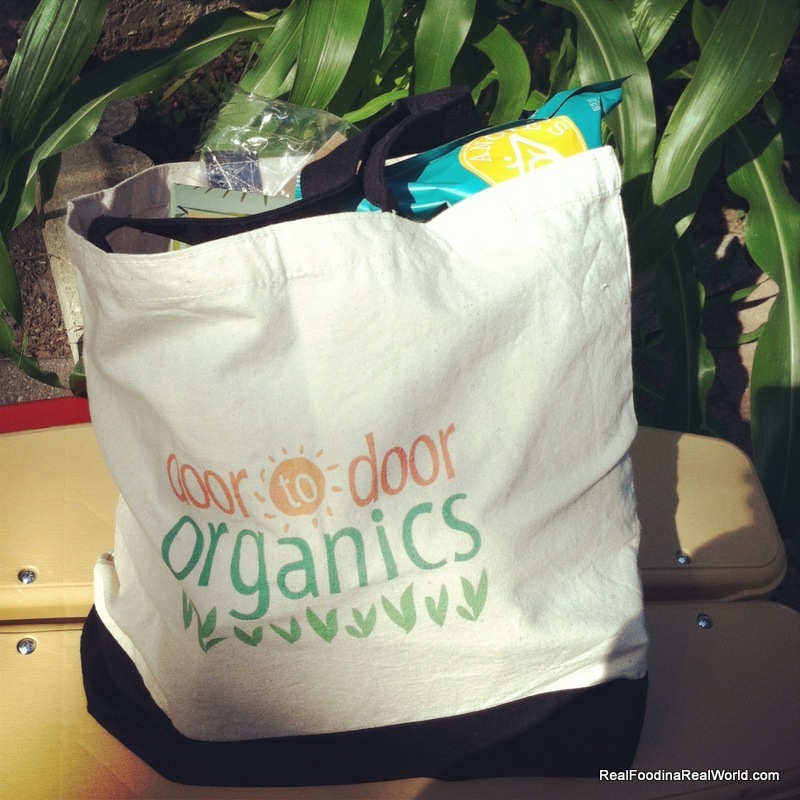 This bag was hand delivered to my front door from Door to Door Organics. There was a lovely hand-written note telling me that they enjoy my blog and social media. The bag was stuffed with so many goodies. I could tell that the items were hand picked for my family and I was touched. 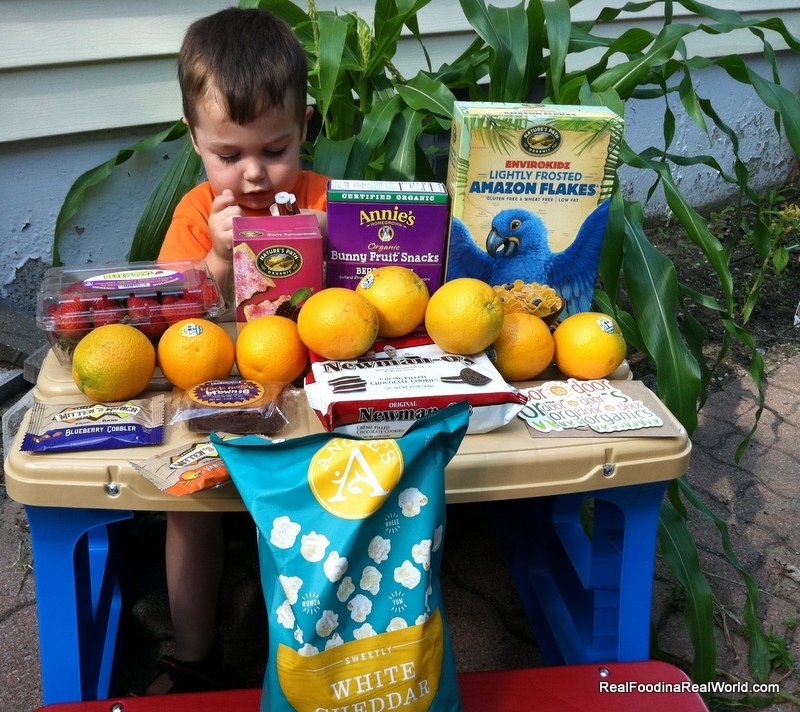 Local toddler was so excited about the goodies he couldn’t stay out of the picture! Lots of good things, some we have tried and some we haven’t! Lots of oranges and strawberries for local toddler. Some cheddar popcorn, Mitten Munch bars, a Zingermans brownie, Newman-O’s, a big Door to Door Organics sticker and some magnets, vegan lip balm, cereal, Annie bunny fruit snacks and some toaster pastries. I know sometimes when reading a blog it can be borderline nauseating to read a blogger go on and on about how great a company is and that company had sent them free stuff. I can tell you that I have been a loyal Door to Door Organics customer for many years and I pay full price every week for my boxes. This is my first “swag” from Door to Door. They really are an awesome company and every person I interact with is great. The warehouse staff are super nice and their customer service is wonderful too. I was treated exactly the same prior to my blog so you can rest assured they are equal opportunity awesome. You can read my full post about Door to Door Organics here, but it needs some updating. Thursday local toddler and I headed over to the Westland Farmers Market. We bought a vegan energy cookie ($1.50) from Macro Val and some green beans($2 or $3, I can’t remember) from O’Keefe O’Ganics. The super nice guys from O’Keefe also gave local toddler his very own little bell pepper. It’s tiny and adorable! I’m super interested in this farm, they are in Willis and use organic practices. 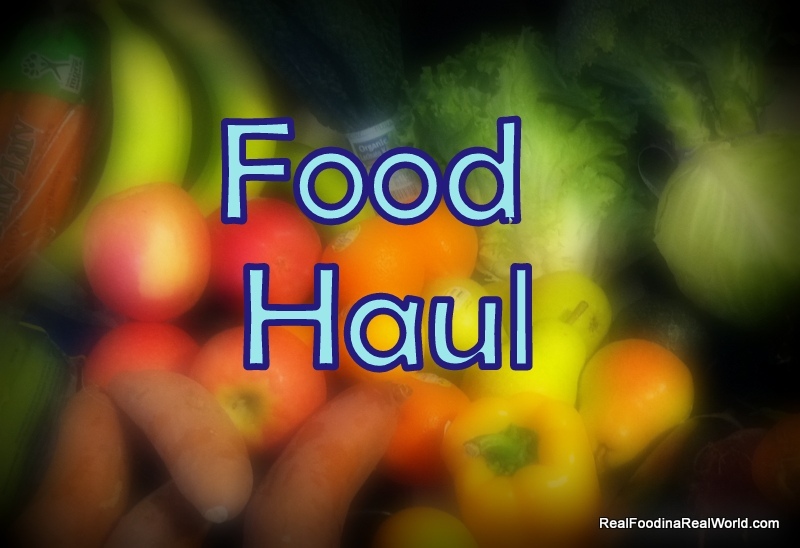 They sell at the Wayne Farmers Market on Wednesday evenings and the Westland market on Thursday evenings. Go buy something from them, I love to see a small farm do well! So for the amazing amount of food this week, the total was $83.50. I’m so lucky this week! Next week I plan to do some canning so I imagine the total will be high. Congratulations on your swag! What a fun surprise! It really shocked me! I really love them, its such a cool company. Hope to see you soon at the Canton market! I got a trial bitty box once. It was really nice.